DAIMON is an international project dealing with munitions dumped in the Baltic Sea. 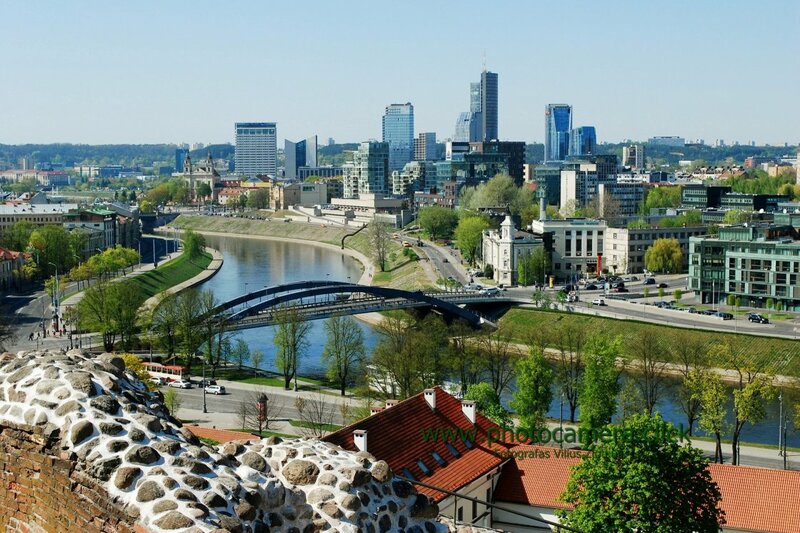 Scientists from Poland, Germany, Sweden, Finland, Norway, Lithuania and Russia are cooperating with experts worldwide in order to solve this transboundary challenge. 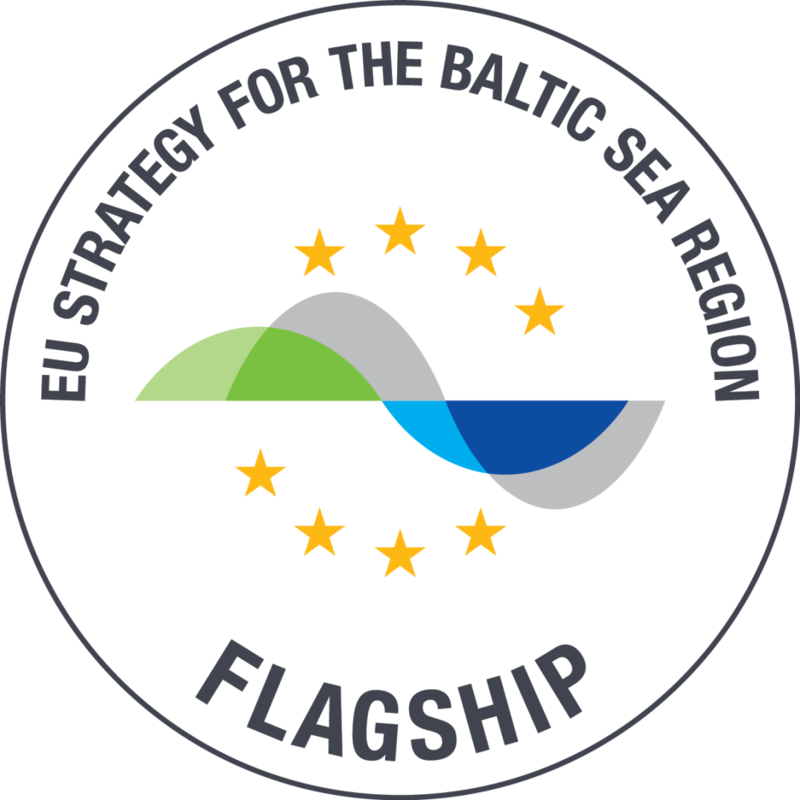 We are part-financed by the EU INTERREG Baltic Sea Region Programme 2014-2020. The Lithuanian Environmental Protection Agency (LEPA) will organise a workshop to present the produced by DAIMON project Decision Support System (DSS) for recommended actions on dumped munitions detected on the seabed. This seminar will be held in English on the 29th of May 09:30 – 16:00 in the premises of the Ministry of Environment in Vilnius. The Finnish Environment Institute (SYKE) performed the first pilot study on blue mussels. 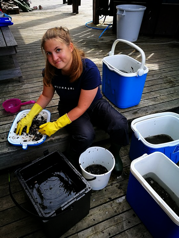 In the in situ –experiment, blue mussels (Mytilus trossulus) collected from a reference area near Hanko peninsula were transplanted to Upinniemi naval base as a suspected contamination point (large sea mine lying on the seafloor). Aim of the experiment was to investigate if the sea mine is leaking TNT or other toxic substances, and if any biological effects or bioaccumulation can be seen in the mussels, which were placed close the mine. The mussels were transported in thermo-insulated buckets to SYKE´s research vessel Aranda, where they were kept in a cold room with aerated water from the collection site until deployment of the cages few days later. The reference cages were deployed with SYKE´s research vessel, but due to the security reasons, the “hot-spot” cage was deployed by the Finnish Navy with their own vessel. The cages were anchored to the bottom and held in a stable vertical position by submerged buoys. After one month exposure time, the reference cages were retrieved in the end of July by RV Aranda, and the “hot-spot” cage later in November by the Finnish Navy. At the same time the Navy divers made thorough documentation of the mine. Mussel samples (400 individuals) for recording the "end" condition of the natural population were collected by scuba divers from the same place as in June 2017. The mussels were dissected immediately after retrieval. Lysosomal Membrane Stability (LMS) was determined by applying the Neutral Red Retention (NRR) assay on live mussel haemocytes. Samples were also stored for oxidative stress biomarkers, other explosive-specific biomarkers as well as for chemical analyses. Baltic blue mussels were exposed under lab conditions to different concentrations of dissolved TNT. Preliminary results showed that exposed mussels immediately change their behaviour to minimise harmful effects of TNT. Further, biomarker response revealed low no-effect-concentrations, emphasising the toxic potential of dissolved TNT. The Norwegian Defence Research Establishment (FFI) is developing a method for detection of certain explosives in saline water based on passive samplers. The explosives and decomposition products selected for the laboratory tests are 2,4,6 TNT, 2,4 DNT, 4,6 DNT and RDX. A Thin-Film ethylene-vinyl-acetate sampler has also initially been tested in the laboratory, but showed very low recoveries for the selected explosives. The POCIS and Chemcatcher samplers are currently being tested for longer exposure times in a laboratory setup to measure their efficiency to collect explosives from sea water. The laboratory tests will be finished in May 2018. The best passive samples will then be deployed at the sea later this year, possibly together with VERIFIN in the Gulf of Finland. As already shown at the 5th DAIMON meeting in Gothenburg in March 2018 the DAIMON interface will provide the possibility to create a new CWA or conventional finding including an ammunition type. Therefore, the type of ammunition can be set based on an underlying ammunition database. 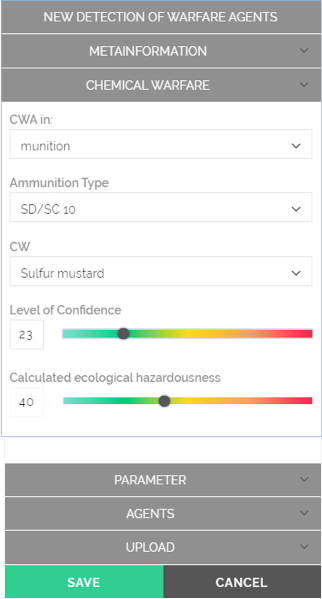 Depending on the type a predefined calculated ecological hazardousness can be used or individually modified by the user. Additionally the level of confidence can be used which sets the overall quality of the information/dataset and is useful especially in cases where higher uncertainties about the finding are present. In April 2018 DAIMON team from Technical University of Clausthal in cooperation with the EGEOS company created a prototype of the ammunition database. It is currently being tested for completeness of the underlying parameters of the different ammunition types. If you would like to take part in this test, contact Sabine Bohlmann. 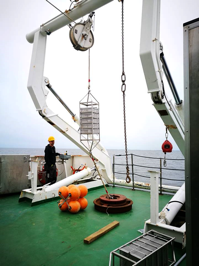 In March and April 2018 a successful passive samplers experiment was conducted in the area of the Bornholm Deep by the IO PAN team. Three passive samplers were deployed in a close proximity of confirmed objects – pars of KC-250 bombs. The exposure time was about 28 days. Three types of passive samplers were delivered to the IO PAN by VERIFIN. 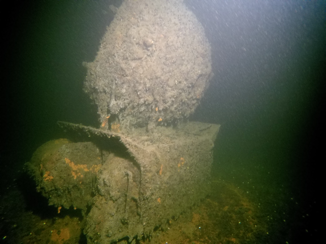 They were mounted on light sampling cages with a zip ties and placed on the bottom at about 93 m. During April’s DAIMON cruise on R/V Oceania the recovery mission was conducted with a ROV. After sampling period, samplers were transferred to clean zip-lock bags, described and stored in a low temperature. While exploring the Bornholm Deep dumpsite the DAIMON team has came across a wreck mentioned in the MERCW report (T. Missiaen, J.P. Henriet, 2002, Chemical munition dump sites in coastal environments., Federal Office for Scientific, Technical and Cultural Affairs (OSTC), Brussels: V. Paka, M. Spiridonov, Part 1 – Status assessment: Research of dumped chemical weapon made by R/V Professor Shtokman in the Gotland, Bornholm & Skagerrak dump sites., pp. 39). 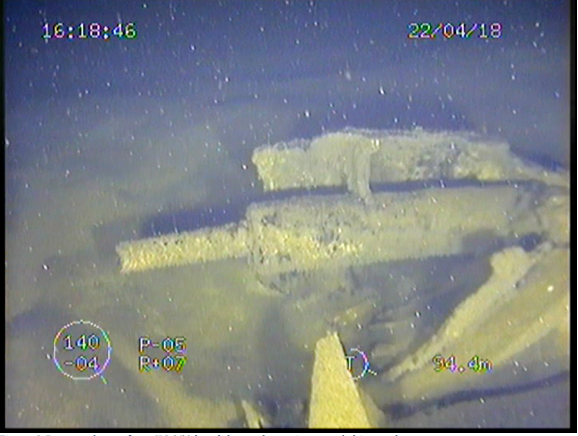 The wreck was explored with ROV equipped with BlueView sonar and video camera. Wreck remains in good shape, although it is covered by many fishing nets, some of them still with floaters, which makes navigation dangerous. AUV had to carefully approach the wreck from each side, backtracking every time, to withdraw umbilical cable, which could entangle in derelict fishing gear. Unfortunately, we were unable to observe chemical bombs laying on the stern of the ship, as reported by V. Paka and M. Spiridov in 2002. However, at close distance, among the lost nets and corroded parts of the ship, an object resembling burster charge from KC 250 bomb was found, as well as a large lump of yellowish substance, which could have been the solidified mustard gas. 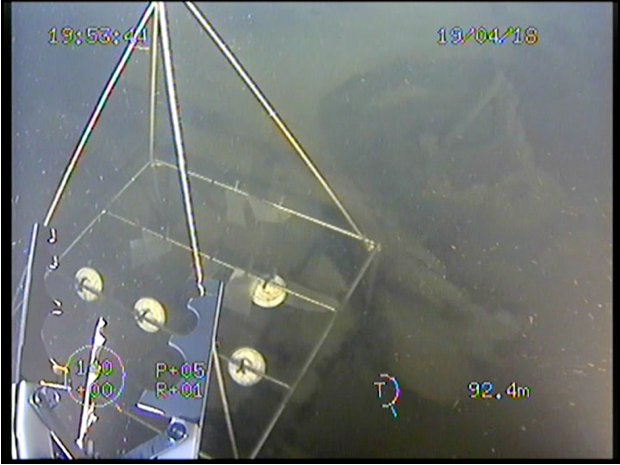 Samples were then collected with second ROV, in transect of 0,5 and 15 m from the wreck. Collected samples were sent for laboratory analysis. In the end of March 2018 Jacek Beldowski (DAIMON coordinator) was interviewed by the major Swedish news agency (TT News) about dumped chemical weapons and the DAIMON project. 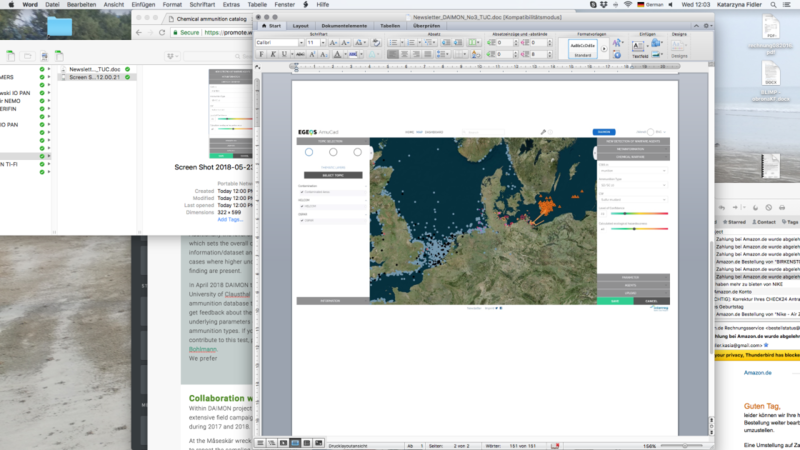 Upon recommendations from Jacek the reporter contacted Chalmers University of Technology in Gothenburg to discuss their decision support tool Vraka-CWA and the ongoing investigations at the Måseskär dump site off the Swedish West Coast, where fish trawlers are stirring up and spreading contaminated sediments. VERIFIN was moreover interviewed on their findings when analyzing contaminated fish from the dump sites and Said Mahmoudi who is professor in international law at the Stockholm University was contacted to discuss why it is difficult to ban trawling at munitions dump sites. Fredrik Lindgren at Swedish Agency for Marine and Water Management also commented on the low levels of contamination found in seafood from the Måseskär dumpsite. Four large paid Swedish daily newspapers have picked up the story and published it or parts of it in early April: “Dagens Nyheter”, “Aftonbladet” and “Svenska Dagbladet”. 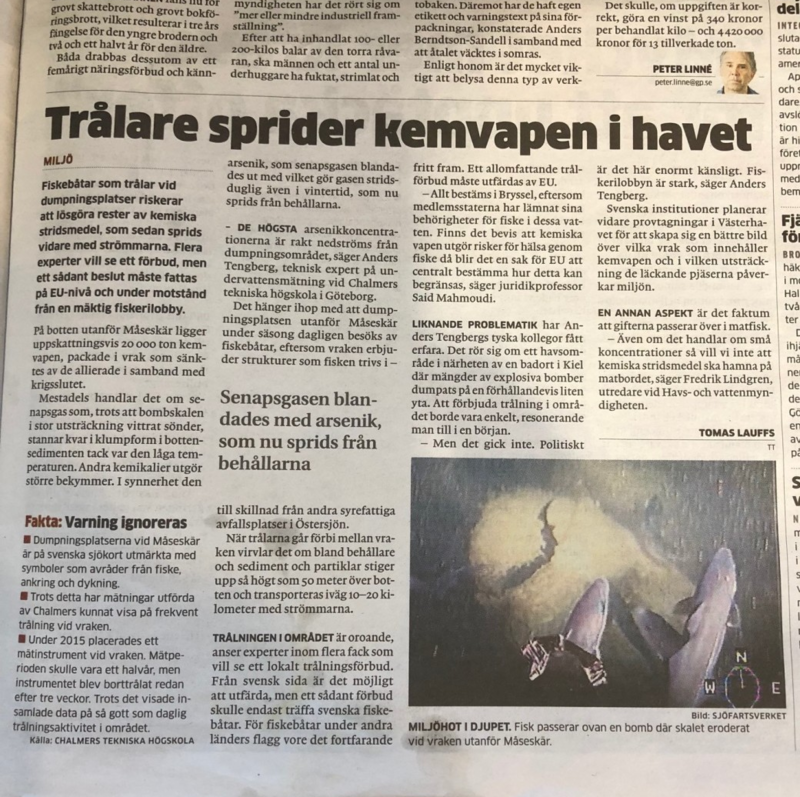 On April 16 the “Göteborgs Posten” published the interview with Fredrik Lindgren as part of a two full-pages story about wrecks in Swedish waters. Fredrik gave account on the on-going work to empty the “most risky” oil filled wrecks in Swedish waters using VRAKA-Oil as prioritization tool. Also the Måseskär wrecks, the dumped chemical munitions, the spreading of the trawlers and the contamination found in fish at the dumpsite was discussed. 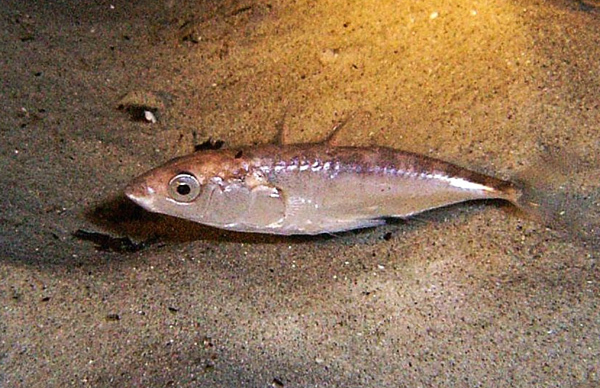 While you read the article ​and please note that the fish on the photograph is not native to Måseskär :-). Journalists on behalf of France Télévisions, Public Sénat and RTBF Belgium visited the AWI and filmed an Interview with Dr. Thomas Lang from Thünen-Institute and Dr. Matthias Brenner from the Alfred Wegener Institute. Topic for the documentary planned to be broadcasted in September 2018 were the potential ecological impacts of sea-dumped conventional munitions and chemical warfare agents in both North and Baltic Sea. The Alfred Wegener Institute (AWI) together with the Thünen Institute (TI-FI) have been awarden a national grant to test the three-spined sticklebacks (Gasterosteus aculeatus) in a lab exposure system. The experiment will start in summer 2018. 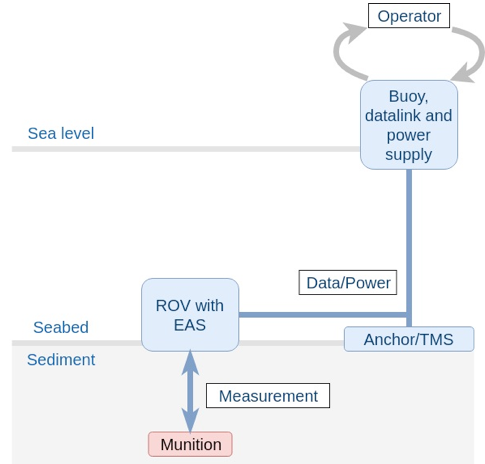 Hannes Vainionpää of VERIFIN has been has been investigating the Elemental Analysis Systems (EAS) technology for identification and condition measurements of sea dumped munitions. In Neutron Gate laboratory measurements of samples consisting of surrogate materials of mustard gas and TNT has been made in air demonstrating the feasibility of the method. Here is shown the spectrum displaying the characteristic peaks of the Cl and H seen in the mustard gas surrogate. Especially sensitive elements are Cl, As and S, also F and P are detectable. These elements can be found in most CWA, incendiary and battlefield gas munition. Measurement in underwater conditions are currently being performed. Envisioned is a system consisting of remotely operated ROV with EAS and a buoy containing power generator and satellite datalink. Such a system could be remotely operated via satellite connection and move indepently from object to object. Shiptime would be required during delivery and recovery. Operator could be located at a land based control room anywhere on the globe. Based on our experiments and expected equipment performance, we estimate EAS could identify munitions within 1 m distance in a time frame of minutes to hours, depending on the measurement conditions.